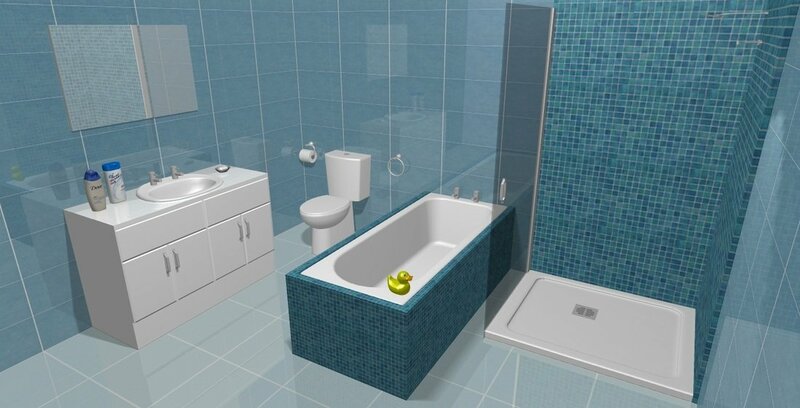 FREE Bathroom CAD Drawing… View Your New Bathroom Before You Buy! DHI work with clients when designing their new bathroom just how they want it. Our designers will provide as many CAD drawings for customers until they are completely satisfied with the plan and design before deciding to go ahead. This service is completely FREE! Planning on designing a new bathroom? Installing premium value fitted bathrooms can certainly be a very expensive investment for homeowners however it is certainly possible to have a first class, modern installation at a very reasonable price if you know where to look and which company to choose such as Glasgow bathroom specialists Dynamic Home Improvements. Situated on the outskirts of Glasgow employing a team of professional, highly experienced design specialists and very importantly, reliable tradesmen who are experts in transforming ugly old bathrooms and en-suites into stylish, functional places that combine tasteful design and superb finishing are exactly what our clients get every time. Today’s modern bathroom should be somewhere that you enjoy experiencing every day… But such an experience doesn’t need to come at a high price. Perfection and value for money has become the main factors in our success. With a very enviable customer satisfaction rate earned from years of producing consistently stunning, fitted bathrooms throughout Glasgow, West Central Scotland and Lanarkshire whilst combining true craftsmanship and easy reach customer service that is second to none. It’s no wonder that 82% of our new business comes from client referrals. Our specialist team of Glasgow bathroom fitters offer a completely FREE planning and designing service which is carried out in the comfort of the customer’s own home. Please take a moment to view our Before & After page where you can view images of some recent remodeling projects carried out by us. Our Glasgow bathroom & Lanarkshire renovation projects range from smaller, relatively straightforward installations to those which are much larger and more technically intensive, however the same attention to detail and high value for money philosophy is utilized throughout each and every installation project, whatever the size and complexity, ensuring that our clients receive the finest possible installation to suit their particular budget and requirements. Our fully qualified planning & fitting experts take pride in installing beautiful bathrooms which are designed to last throughout Glasgow, Hamilton, Lanarkshire and the surrounding areas. Should you decide to appoint us as your installation team, a dedicated project manager will be assigned to your installation who will liaise with you regularly and ensure that you are kept up to speed with the progress of your new bathroom installation, from the beginning through to completion. We offer a fantastic range of modern tiles, designer baths, taps, showers and elegant furniture that are guaranteed to transform your bathroom or en-suite into a unique area within your home that you will absolutely love. At DHI we don’t simply offer our clients what we want to sell them. Unlike many bathroom renovation companies, we listen to what our clients really want and then advise accordingly, taking into account our thoughts on how the new design will impact on possible future property sale value and how the project should reflect the overall look of the home and suitability for all members of the family. We are conveniently located in Hamilton, just 15 minutes drive from Glasgow which is important for our client’s peace of mind should any small issues occur after the bathroom installation project has been completed. We employ our own specialist, responsible tradesmen, NOT sub-contracted, un-reliable laborers. So, if you are planning on having a new bathroom or en-suite created why not contact your fitted bathroom specialists Dynamic Home Improvements today on 01698 300820 or simply complete the short contact form to arrange your FREE plan and design and discover how our experts can transform your tired looking bathroom into a place of elegance and stylish beauty… For Less than you think!